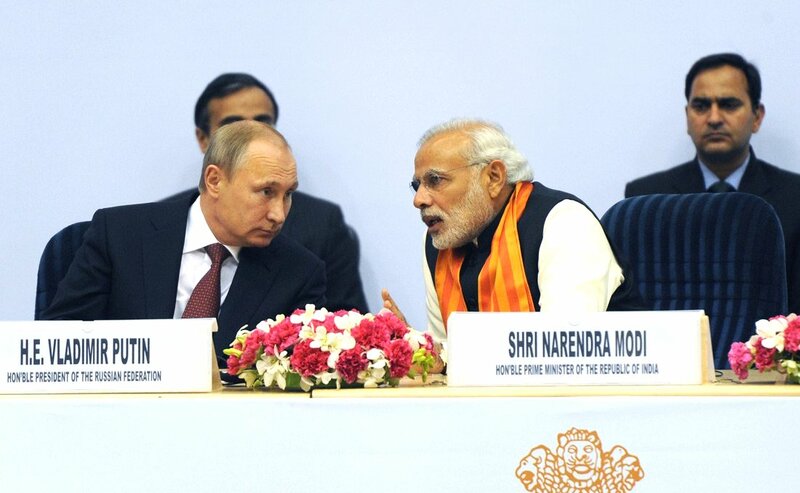 Vladimir Putin and Narendra Modi in New Delhi, 2014. The Russian President is due to arrive in Goa on October 14 for a three-day visit, during which he will attend the BRICS summit and participate in the 17th annual Russia-India summit, in which terrorism and defence issues are high on the agenda. Vladimir V. Putin, President of the Russian Federation, will visit Goa from 14 to 17 October 2016 when, besides attending BRICS Summit, he would also hold 17th India-Russia Annual Summit with the Prime Minister of India, the Ministry of External Affairs (MEA) stated in an advisory issued on Tuesday. Sources in the Indian government told RIR that Prime Minister Narendra Modi would prioritise the issue of terrorism at both summits, particularly focusing on “one country in the region” (Pakistan) which has “become a global menace,” a source said. In this context, during his summit meeting with President Putin, the 17th since the practice of annual summits was initiated in 2000 when the two countries became strategic partners, Prime Minister Modi will raise the issue of Russia’s defence collaboration with Pakistan, clearly explaining why it is detrimental to India, a source told RIR. It will be pointed out to President Putin that any arms sale to Pakistan directly impacts India, unlike purchases of defence equipment which New Delhi makes from the United States, Israel or France, for example. Those arms purchases can, in no way, target Russia. Any weapons purchased by Islamabad, whether intended against terrorists or not, are used against India, the sources said and this will be conveyed to President Putin. The Indian Prime Minister will, however, not raise the issue of the first joint military exercises that Russia and Pakistan have held in the northwest of Pakistan, the sources said. Alexander M Kadakin, Russia’s Ambassador to India, had said in an interview that those exercises were intended to be counter-terrorism exercises between the militaries. Pankaj Saran, India’s Ambassador to Russia, however, cautioned that there could be “problems” ahead in bilateral relations between Russia and India if Moscow continued to strengthen its defence ties with Islamabad. “We have conveyed our views to the Russian side that military cooperation with Pakistan, which is a state that sponsors and practises terrorism as a matter of state policy, is a wrong approach. It will only create further problems,” Saran said in an interview with Ria Novosti, ahead of the bilateral summit. Saran also highlighted the robust technical and military cooperation between Russia and India, which, he said, was expected to grow. Recently, India-Russia relations reached a new landmark in nuclear power cooperation, with President Putin and PM Modi jointly dedicating Unit 1 of the Kudankulam nuclear power project to the Indian nation. Units 2 to 6 are also on the anvil. At their bilateral Summit in Goa on 15 October 2016, the Russian President and Indian Prime Minister are expected to “review the entire gamut of India-Russia bilateral relations and review the progress made since the last summit held in Moscow in December 2015,” the MEA stated. Traditionally, the Indo-Russian strategic partnership has been built on five major pillars: politics, defence, civil nuclearenergy, anti-terrorism co-operation and space (which encompasses high technology), a former Indian Foreign Secretary Ranjan Mathai had said. To these five pillars has been added a sixth, the economy, which is now being pursued with equal vigour. “Important bilateral agreements are expected to be concluded and a joint statement released at the end of the summit. Further, given that the year 2017 marks the 70th anniversary of the establishment of diplomatic relations between the two countries, a number of commemorative celebrations marking the important milestone is planned,” the MEA statement said. Foreign office consultations were held on October 7 in New Delhi between senior officials from the Indian and Russian foreign ministries, to finalise the agenda and ready the documents to be signed during the Modi – Putin summit, and review the state of bilateral ties. Key defence agreements likely to be signed during the bilateral summit include India’s acquisition of four S-400 ‘Triumf’ advanced air defence missile systems, lease of a nuclear - powered submarine, estimated to be worth over a billion dollars, and joint upgrading of the Su 30MKI and Kamov 28 helicopters. Indian Defence ministry sources have indicated, according to reports in the media, that both countries will sign an agreement for the futuristic fifth generation fighter aircraft (FGFA). Bilateral Cooperation has increased significantly in all the spheres over the years. Declaration of Strategic Partnership between India and Russian Federation was signed in October 2000 in New Delhi heralding the mechanism of Annual Summits. This was subsequently raised to a “Special and Privileged Strategic Partnership” in 2010. India will also push hard for the Comprehensive Convention against International Terrorism (CCIT), which it introduced 20 years ago in 1996, to be adopted by the United Nations. It will urge two of the five permanent UN Security Council members who are part of BRICS, Russia and China, to push for its early adoption. It is unclear how far China will push an issue which could adversely affect its close ally, Pakistan, and this could even cause a shadow over the proceedings of the BRICS summit, a source told RIR. Meanwhile, in the wake of massive security preparations for the BRICS summit, all unmanned aerial vehicles (UAVs) or drones, para- and sports gliding and hot air ballooning have been banned up to 100 km from the main venue of the BRICS summit by the South Goa district administration from October 14, a Goa government spokesperson said on Wednesday. "The ban is on low-flying objects such as para- gliders, hang gliders, hot air balloons, aero models, airborne video cameras/drones and similar short-range aerial vehicles up to a distance of 100 km around the Taj Exotica hotel from October 14," the spokesperson said. The spokesperson also said that air space restrictions had been imposed around 300 km from the same hotel from 4 pm on October 14 to 4 pm on October 17. Normal commercial flights shall also not be permitted to take-off and land at Goa's Dabolim airport and subsidiary airport within the area during the 96 - hour period.